The Bachelor of Fine Arts exhibitions celebrate students graduating from PSU’s intense, highly focused professional programs. 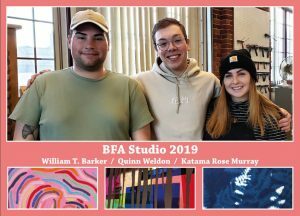 Throughout the year, BFA in Studio Art students delve into personal themes, motifs, and media to achieve a mature body of work, culminating in an exhibit for the public. The Bachelor of Fine Arts exhibitions celebrate students graduating from PSU’s intense, highly focused professional programs. 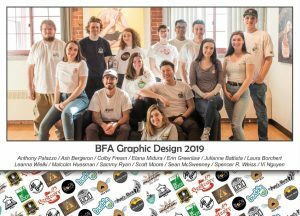 Students in the BFA Graphic Design degree program present their capstone year’s work in developing marketing materials for their fictitious company including logos, stationary, advertisements, posters, pamphlets, publications, and sample products. This exhibit is an inspiring look at student learning that is leading directly to career paths.